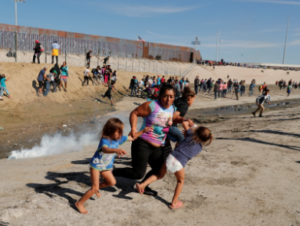 On the afternoon of Sunday, November 25th, Central American migrants seeking asylum in the United States were met with tear gas fired by the U.S. Customs and Border Protection Agency. When the migrants began their march to the border, they were stopped at a bridge leading to the border crossing where Mexican federal police officers carrying riot shields formed a blockade. Many then attempted to cross through the nearly-dry Tijuana River, but were halted by barbed wire fencing and tear gas released by United States Customs and Border Protection Agency officers. A smaller group faced tear gas and additional law enforcement at a set of nearby train tracks. In response to the migrants’ march, the U.S. closed the Tijuana port of entry for several hours on Sunday, before it was re-opened later that day. President Trump has since strongly defended the border patrol’s decision to release tear gas, asserting to press that officers were “being rushed by some very tough people.” In addition, Chief Patrol Agent Rodney Scott told CNN that his agents were “assaulted” by rocks thrown by migrants and that they “deployed tear gas to protect themselves and to protect the border.” At the same time, Scott admitted that only three agents were confirmed to have been struck, none of whom were seriously injured. The tear gas used was also claimed to have been “a very minor form” and “very safe” by President Trump. This was later contested by the U.S. Customs and Border Protection Commissioner Kevin McAleenan, who told CNN that the CS gas deployed that day was standard law enforcement equipment. McAleenan additionally told CNN that the people throwing rocks were adult males, and that it is “very unfortunate that parents are putting their children at risk and bringing them into that situation.” President Trump made a non-evidential claim that some of the asylum seekers in similar photos were “grabbers:” non-parents who appear at the border with a child hoping that they will be granted a different status. Reuters photojournalist Kim Kyung-Hoon’s image of a mother and two barefoot, crying children in diapers running away from the gas circled widely around the internet after the incident. The individuals in the photo, Honduran migrant Maria Meza and her twin daughters Cheili and and Saira, were later identified. “I thought I was going to die with them because of the gas,” Meza told Reuters reporters. Trump later denied tear gas being used on children at all, despite photographic and video evidence. The Associated Press reported children screaming and crying as the wind carried fumes to people who were “hundreds of feet away.” In the aftermath of the situation, the American Academy of Pediatrics released a statement showing their support for “special protection and humanitarian assistance” for children seeking asylum. “The use of tear gas on children—including infants and toddlers in diapers— goes against evidence-based recommendations, and threatens their short and long-term health,” it reads. While it is legal for police and federal law enforcement to use tear gas for riot control, many lawmakers and organizations have questioned its justification in this particular scenario. Reuters reported that Babor Baloch, spokesperson for the U.N.’s refugee agency, emphasized the universal rights of asylum seekers during a Geneva news briefing. “Any person whose life is at risk in their country of origin must be able to access territory and request asylum in a safe country,” he said.